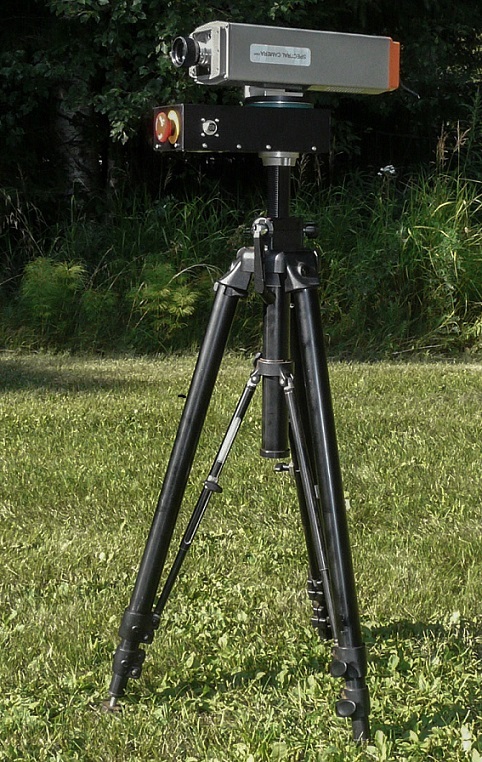 The Rotating Scanner unit can be attached directly to a standard tripod with a 3/8" screw. The Spectral Camera is attached to the Rotating Scanner with an adapter that is equipped with a special bayonet enabling quick installation and release of the Spectral Camera. The Rotating Scanner has one connector for both operating voltage (+24 VDC) and the scanner control (serial RS232 interface). A cased Spectral Camera can be electrically connected directly to the Rotating Scanner, without any additional power supply and serial cable to the computer. For an OEM type spectral camera, the Rotating Scanner is delivered with a seperate power supply/serial cable. There is a switch for immediate stop of the scanner operation for emergency situations. The Rotating Scanner can be controlled for scanning speed and angle with Specim LUMO data acquisition software. The max scanning angle of the rotating scanner is limited to 180 degrees with electrical limit switches. It can be extended up to 270 degrees by special request.